Chocolate is one of those foods that has been in the media a lot over the last few years. Reports came out saying "Dark chocolate is good for you! It's loaded with antioxidants!". Chocolate lovers everywhere jumped for joy thinking that their daily chocolate fix was actually benefiting them. Recently, more articles have come out to squash these previous claims. The newest reports show that the claims made for chocolate may have been exaggerated and that the typical chocolate found in stores is no better than any other sugary treat. I hate to break it to all you chocolate lovers out there but this is, in fact, true. The reality is that most dark chocolate bars you find in grocery and health food stores are processed in such a way that it takes away from any beneficial properties that the cacao naturally has. Most bars have the first few ingredients listed as sugar, modified milk ingredients and cocoa butter. Any raw form of chocolate (known as cacao), which contains the beneficial nutrients and antioxidants, has been processed out into cocoa mass. This processed form of cacao gives the flavour of chocolate without any of the benefits. Another thing that you need to watch out for in the majority of chocolate bars is a something called soy lecithin. Lecithin is naturally found in things like eggs, milk, soy and sunflower. Lecithin found in foods is a beneficial nutrient to have in your diet as it provides us with choline and it helps with the digestion of fats. However, the highly processed, GMO soy variety found in chocoalte bars is not doing you any good. Soy is difficult to digest and you can guarantee that in its non-organic form, you are consuming a genetically modified ingredient. Don't panic. I'm not here to tell you to swear off chocolate forever. It's all about choosing the right kind of chocolate. There are plenty of organic varieties of chocolate that contain a few simple ingredients and no emulsifiers or added flavourings. Be cautious though- organic does not always equal healthy. Read your labels and stay away from additives and funky ingredients that you don't recognize. As usual, one of the best options is to make your own variety of chocolate at home! 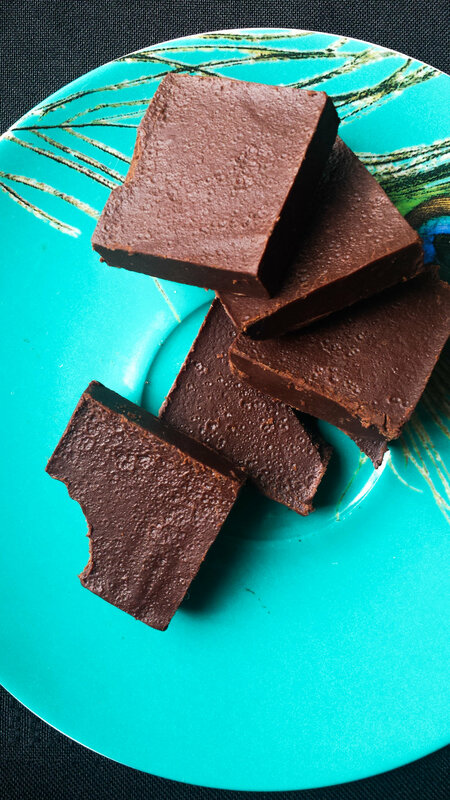 This coconut oil chocolate is so simple and the best part is it's actually good for you! The cacao in this recipe is in its raw form which means it is full of the beneficial nutrients like magnesium, iron and fibre. You most likely have regular or dutch-processed cocoa powder in your pantry right now. This recipe would be equally as delicious using these forms of coao powder, however it will be less nutritious. Think of cocoa powder and raw cacao as white bread vs. whole wheat. Both are made with the same fundamental ingredient, however, white flour has been processed and stripped of any nutritional value. Traditional cocoa powder has the same texture and flavour, but it lacks the antioxidants and other nutrients that raw cacao has. Raw cacao can be found at any health food store and it is a great ingredient to have in your pantry. Add it to smoothies, cookies and bars for a delicious and nourishing chocolatey flavour.